Put those fresh or dried herbs in some vodka or rum to make homemade extracts of numerous flavors. Make small batches for your own baking needs or consider making large batches and giving them away later to foodie friends. The alcohol content will prevent spoilage meaning you can make that extract now and keep it in a dark cabinet until the holiday season comes in November. If you need a few ideas, check out these tutorials, but feel free to experiment with any herbs you have on hand – think anise hyssop, lilac, bee balm, etc. Use homemade extracts in the same way you would use commercial extracts as a flavoring to baked goods and frosting. Having homegrown extracts allows for more creative recipes and flavors later on. Honey is obviously a sweet ingredient but has a place in savory applications as well. Use the flavored honey in yeast breads for a hint of flavor, use it barbecue sauces, and in any recipe that calls for unflavored honey for an extra bit of homegrown flavor. Be sure to check out the book The Herbal Kitchen for lots of creative ideas for making infused honey. Use the flavored sugar just like you would use any plain sugar in a recipe in a one-to-one substitution. Drying herbs is an obvious method of preservation. It's easy and doesn't take up much room. Dry lots for your own baking needs and keep extras around for gift giving later. Dried herbs tuck nicely (and cheaply) into care packages and when packaged in pretty jars make for a great gift for local friends. Be on the lookout this summer for interesting jars that can often be found quite frugally at yard and rummage sales. Need some new ideas for all those dried herbs, consider these recipes. So as those herbs start flourishing, get them back for multiple harvest and preserve them for homegrown baked goods later this year. You'll be glad you did! 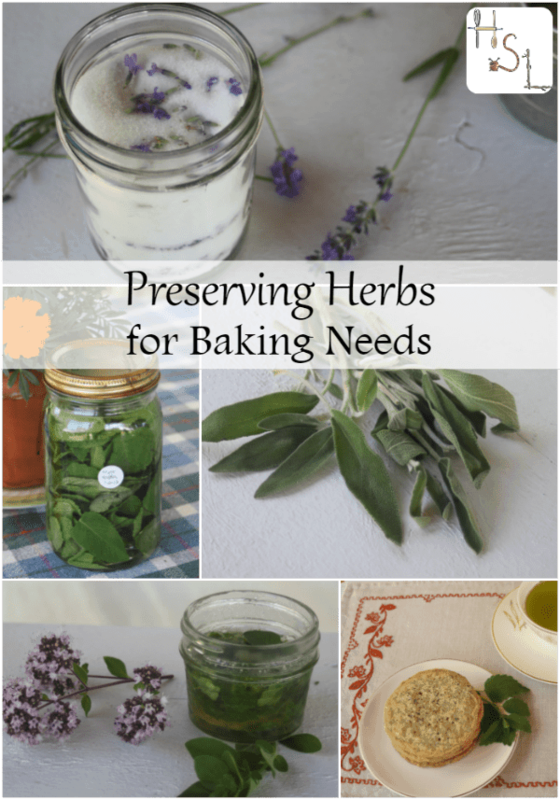 Do you have a favorite way to preserve herbs? How about a favorite way to use herbs in baked goods? What’s the best way to store dried herbs, in a plastic bag or glass jar? I personally like glass jars, easy to store and see on the shelf. What is the self life of dried herbs? Use them up within a year. If they’re completely dry they’ll last pretty much forever in that they won’t spoil but their flavor will definitely fade after a year.